FamilySearch announced the addition of new premium online genealogy services available for free through its family history center network. The expanded services are in keeping with FamilySearch’s goal to provide increased economical access to records that will assist individuals in family history pursuits. Following is a list and description of the new resources. Footnote is a subscription-based website that features searchable, original documents that provide users a view of the events, places and people that shaped the American nation and the world. The site will have over 25 million digital images by the end of 2007. Footnote is currently working with FamilySearch to index the American Revolutionary War Pension files. Additional projects with FamilySearch are under development. Individuals with Footnote subscriptions will still be able to sign in with the same Footnote username and password they use at home to save, annotate, and upload content. Access to this service will be limited to 1400 family history centers in North America. Patrons should contact their local family history center to see if this service is available if their local center. Family history center directors should contact Family History Center Support with questions. Kindred Konnections has over 230 million pedigree linked names with submitter information. The online pedigrees are not merged, but maintained by individual patrons. There are additional databases of birth, marriage, death, and census records that are automatically searched along with the pedigree linked data. 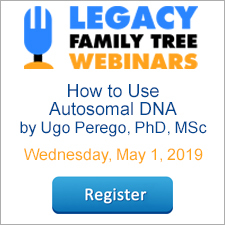 Segments of pedigrees can be downloaded. WorldVitalRecords.com provides access to research helps and has a wide variety of international records, including more than 60 Parish registers, Scottish death records, UK marriages, and Irish prisoner records. There are more than 300 newspapers with 100,000 pages added a month, and over 500 online databases, including vital, military, land, pension records, reference materials, family histories, maps, gazetteers, and international coops. With the recent Quintin Publications partnership, WorldVitalRecords will soon have more than 10,000 databases online. At least one new database is added every business day. The other day I was teaching my 6-year-old how to "Google." He needed information for a homework assignment. Out of curiosity, we did a search for his full name. I was shocked with Google's findings. Google found one exact match for his full name. We clicked on the link and got the "page is no longer available" message. Knowing that Google archives most web sites, I backed up to the results page, and instead of clicking on the link, I clicked on the link entitled "Cached". The resulting page was a Family Group Record that contained all of my family's personal information - our birth dates, marriage date, and complete names of each member of our family. Whoever originally published my family's information hopefully realized that they should not have, and it appears that they removed our information from their website. What they may not have realized, is that Google, and other services, takes snapshots of each page examined as it "crawls" the web, and caches (archives) these as a backup in case the original page is not available. Most of the time, for genealogists this archiving of information is good. How many of us have returned to a web site where we once located valuable information on our ancestors, only to find that the web site no longer exists? In these situations, clicking on the "Cached" link in Google's search results will often pull up the missing page. Click on the Reports icon in the main toolbar and select the Family tab. Click on the Report Options button and click on the Format tab. In the top right, click on the option to "Suppress details for living people". You can even choose its sub-option, "Change name to "Living"." When is the last time you Googled your name? Give it a try - you might be surprised what you find. First, make sure that tagging is turned on by clicking on the Options menu, clicking on Customize, and on the General tab, enable Tagging Options. In the Tagging Options section here, click on the Tags to Show button. Select your tags, click Save, and click Save. At some point in your research, you will likely need the ability to mark a person, or a group of persons, so you can easily refer to them. For example, you may have used Legacy's Master Location List tool to locate all persons who lived in a certain locality. You want to work with this list of persons to do more research on them. Legacy's tagging feature enables you to mark everyone in the list with a certain tag number. Then, in the future, you can easily pull up this list again. How to create a list of "ancestors with no sources"
Watch excerpts from Legacy's Tagging and Searching Made Easier by clicking here. Scroll down to the last video and click on the View Preview button. If you use a digital camera or a scanner, then you have hopefully already learned about the "before-taking-your-first-picture" rules or the "before-you-scan" rules for genealogists. If not, you may have a little catch-up work to do. 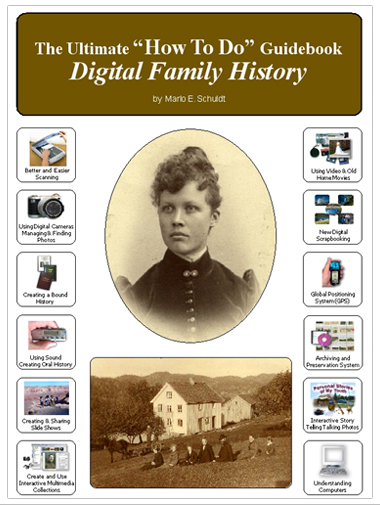 The Digital Family History Guidebook, by Marlo Schult, does a thorough job of explaining all the rules and "mine fields" for digital imaging. Its nine chapters (over 200 pages) of helpful information is designed to help you with family history projects while saving you time, money and frustration. Using sound is easier than you think. All you need is an inexpensive microphone or a cable to attached to your cassette recorder. Use a microphone to tell stories or create oral histories. Learn to edit your narrations. Copy the priceless old cassette tapes to your computer with recordings of grandma or other family members. Save time, money and get better quality by doing it yourself. Internet links are provided for free sound editing software. Managing and finding your photos later and suggestions for buying a new camera are included . Converting Old Home Movies - do's & don'ts. Read this chapter BEFORE you invest a lot of money getting your old movies converted to a DVD. Why You Need to Start Using GPS. New and fun things you can do - free software links. Adding screen captures of satellite images is both fun and adds realism to family history. Presents a different perspective about how to take advantage of new technology and samples of how to create digital scrapbooks. Something new and very different from traditional scrapbooking. Stories are a real treat and the spice of life. This chapter offers some excellent suggestions that will help you put new life into old stories. You will discover some new ways to tell stories and make them more interesting. Are you struggling with how to organize ALL your materials - photos, sound files, video clips, text documents, PDFs and other file types? The Guidebook will show you how to make your file collections more useful and organized. Ways to save money and things you need to know and avoid BEFORE you begin. What's Paper grain? Have you ever opened a book that resisted staying open? Have you seen a book with a broken or cracked spine? These are few of the symptoms of a book that has been printed and bound with the paper grain running in the wrong direction. There is much more you need to know. Chapter 7 takes you through each step required to create a beautiful history or biography. Checklists and simplified instructions will make it easy. Ways to find and protect your treasures while saving hard drive space. Don't wait until you have a hard drive crash or a virus attacks your computer. Basic computer terminology is explained in everyday terms. Computer hardware is explained. If you are gong to buy a new computer you need to read this chapter first. Suggestions for maintaining your computer. Click here to order from our secure store, or call 1-800-753-3453. In what officials say will be a quantum leap forward in providing family history information online, the LDS Church has announced a plan designed to eventually help provide access to as many as 80 billion family records on the Web, in addition to the tens of billions of records it is currently indexing out of its own Granite Vault microfilm archives. Director Richard Black is pleased to announce a partnership agreement between Godfrey Memorial Library and FamilySearch. Legacy Home - Deluxe Edition users should watch the news items on the Legacy Home tab for special offers and "extra-cool" articles. The free Standard Edition users can expect to continue to receive many great articles but hey, there has to be some cool things that only the Deluxe Edition users get. How much space is left on your computer? Although today's computers come with very large hard drives, your free space can fill up quickly - especially if you are taking lots of digital pictures and movies. If your computer gets low on free hard disk space, your computer will run into new problems. The "C" drive is the drive where most computer users store all of their files. Right-click on the "C" drive, and click on "Properties". You will see an screen similar to the image below. This image shows the used and free space on Drive C. Notice it is about 75% full. Depending on how you use your computer, this could mean that you have very little space left, or it could mean that you have enough space to last you for years. I recently noticed that my hard disk space was filling up quickly because of all the digital pictures and videos I was adding to my computer. I purchased a 500 GB external hard drive from the local office store for about $150. If I wanted, I could now use this drive to store all these files, or even use it as a place to back up my entire hard drive. FamilySearch Indexing continues to be the greatest advancement in genealogy technology in years. 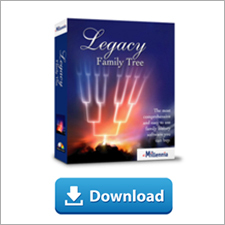 We continue to encourage all Legacy Family Tree users to participate in this new project. There are many indexing projects currently available, with many more in the works. Which project you work on is entirely up to you. After opening the software, there are two main buttons. If you click on "Download Indexing Batch" you will be indexing the documents that fall into FamilySearch's highest priority documents. In other words, FamilySearch decides which document they want you to index. If, however, your ancestors lived in Illinois in 1900, you might want to participate in the 1900 U.S. Illinois Federal Census indexing project. You have the choice! Just click on the "Download From..." button, and you can choose any of the existing projects. Click on the image below to see what this looks like. If you have not yet signed up, please visit www.FamilySearchIndexing.org. To read our initial announcement about the project, click here.